Remember the notice that Crane & Co. wants pen pals? Of course I did write in a letter, though we all know I don't need any more pen pals... I somehow doubt the lovely marketing lady really intends to correspond long-term with anyone, but it's a nice thought and I wanted to send a supportive gesture. And hey, the possibility of winning some goods from Crane & Co. paper was a nice incentive, too. So I had to make my letter nice and pretty, since I'm sure she's getting quite a deluge of pulchritudinous post. I used some washi tape, Japanese decorative masking tape, and my own Missive Maven-designed stamps and stickers, with white ink on a red envelope. That's my dandy new return address sticker (a la moo.com) on the back. I know of one person who said she'd heard back from the official pen pallers at Crane. I know a lot of us have written - anyone else heard back? I have a feeling that they didn't quite know what they were getting into when they asked for handwritten mail on the Crane blog, but I hope they are enjoying the letters that are coming their way. Read the details of their offer here. yep I heard back from this glorious lady as well and wrote a reply as well so we shall see if she continues to correspond . I received a lovely letter in return within about a week. I sent a Crane note card with a fountain pen motif. Wrote a few words about collecting fountain pens. The response was on a Crane note card too. A hand written response, with mention of the weather (Irene had recently visited) & with a comment that indicated Jessica had actually read my card. Yep! I wrote and recieved a reply and wrote again as there was no specification on whether this was a one time mailing or an active correspondence. I too doubt they will continue it for long. 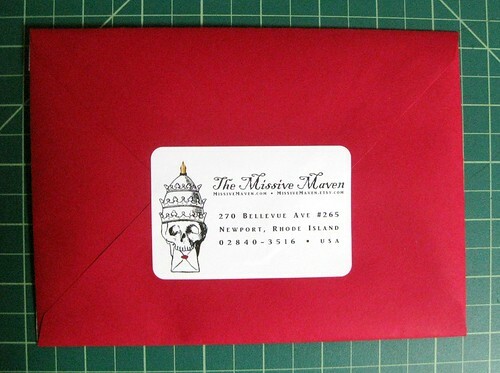 I sent mine on some of the vintage papers in my collection since I have very, very limited quantities of Crane. I am so glad to hear that all of you have received excellent letters in response! That's great news. I'm curious to know how many letters they've received to date: Are they keeping a log? 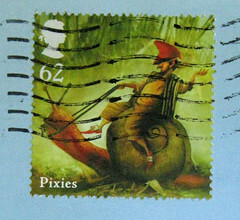 Missive Maven: Since you are quite possibly the only person I know who happens to love all things mail-related as much as myself, I thought you might be interested in reading my blog (http://sorcha-sidhe.blogspot.com/) on Mondays: I've started a weekly feature where I can indulge in my postal obsession called Monday Mail Out. I got a response, too. And I have a response to that in my mailbag for lunchtime writing today. My mom used to say a letter isn't a letter until it has a response (which has added a whole other level of guilt to my very long turnaround time, but that's a subject too complicated to get into), so I just can't leave the short, but sweet note I received unanswered. I sent a letter not too long ago, so haven't heard back yet, but it sounds like they really are responding to everyone thus far! 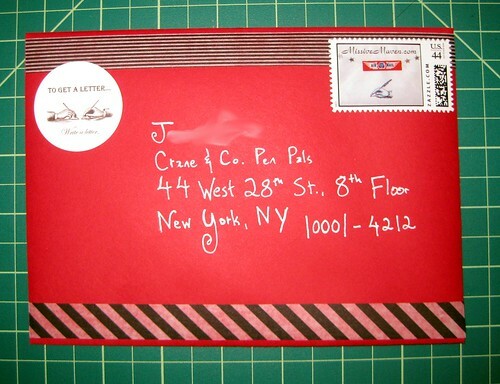 I didn't have any Crane stationery to write on, so I made my own and used a mail art envelope. Hope they like it. It's interesting to hear that other people thought about writing on Crane stationery. I do have a fair bit of Crane, but I decided to use non-Crane because I figured the recipient saw a lot of Crane cross her desk, and I wanted to send something she might not have seen. But I certainly did consider the "sending on Crane" angle! Love that Crane is responding! It's interesting to note that almost everyone expects it to be short-lived. :( Is that due to past flakes, or just that it is a company? I wonder if people want to write to more companies like this if they felt it would be long-term. I'm bummed, I wrote my letter ages ago but didn't hear back at all. Sharks - Jessica has gotten a LOT of letters, and she's still responding to them! I haven't heard back either, but I know she's gotten my letter and will respond.